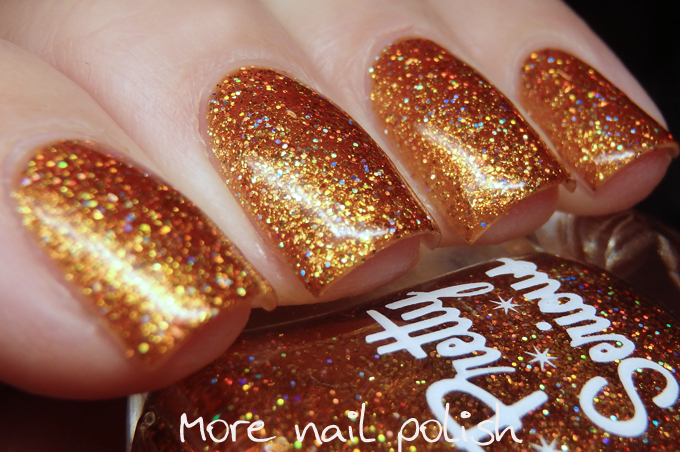 Here is a swatch of another polish that I picked up at Aussie Indie Con. This is Pretty Serious, Wish you were beer. Oh how I wish I was able to photograph this to look like it does in its natural, glorious, real life form. It's so much sparklier and amazing. It reminds me of OPI Golden Eye, but with holo and a more jelly finish. I generally go for much cooler toned golds, and really this is more of an amber shade, but wow, I do love it. This is a convention exclusive polish, but I believe there are still a few bottle available on the Pretty Serious website. I did two coats for this swatch and a thick coat of Seche Vite top coat.